I hope that my Atlanta readers will join me next Friday, February 3 for Drinks & Antiques- A Night for the Young and Savvy at The Cathedral of St. Philip. The party, part of the annual Cathedral Antiques Show, will be an opportunity for young designers and collectors to peruse the offerings of participating antiques dealers, all while socializing in a festive atmosphere. Of course, being able to purchase antiques and vintage pieces is enough of a draw for me, but in case you need a few more reasons to entice you, there will be music, libations, and both a slider station and a mac n cheese bar. 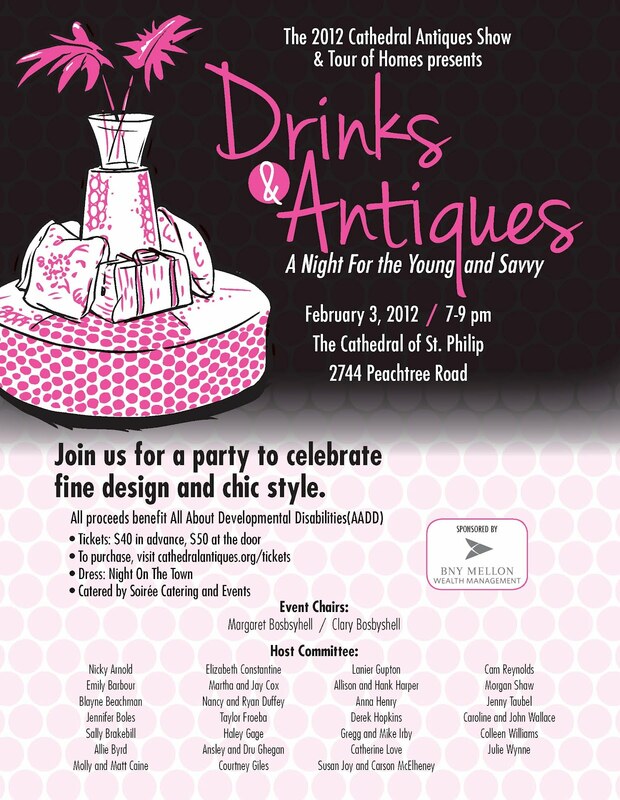 But the most important reason to attend is that all proceeds benefit All About Developmental Disabilities (AADD). Tickets are just $40 in advance and $50 at the door. I was happy to be on the e-mailing list for this show. Although I cannot make it this year, I hope to attend in the future. I know it will be a huge success!